Dear Reader, we have for you an excerpt from Bhagavan Sri Sathya Sai Baba‘s own writing, a chapter from the sacred volume “Sandeha Nivarini”. Devotee: Swami, can we ask you freely about any topic concerning the spiritual path, which we do not know? Sathya Sai Baba: Certainly. What is the objection? Why this doubt? What am I here for? Is it not for explaining to you things you do not know? You can ask me without any fear or hesitation. I am always ready to answer; only, I want earnest inquiry with a desire to know. Devotee: But some elders say it is wrong to vex the Guru with questions. Are they right, Swami? Sathya Sai Baba: That is not correct. Whom else can the disciple approach? Since the Guru is everything to him, it is best that he consults him in all matters and then acts. Devotee: Some say that we should reverentially carry out whatever the elders ask us to do without raising any objections. Is that your command also? Sathya Sai Baba: Until you develop full faith in them and know that their words are valid, it will be difficult for you to carry out their orders reverentially. So, until then, it won’t be wrong to ask them the significance and the validity of their orders, so that you may be convinced. Devotee: Swami, whom are we to believe, whom are we to discard? The world is so full of deceit. When those, whom we believed are good, themselves turn out to be bad, how can faith grow? Sathya Sai Baba: Well, My boy! Where is the need for you in this world or any world to grow faith in others? Believe in yourself, first. Then believe in the Lord, Paramatma (universal being). When you have faith in these two, neither the good nor the bad will affect you. Devotee: Swami, faith in the Lord too diminishes sometimes. What is the reason for that? Sathya Sai Baba: When one is deluded by the mere external world and when one does not attain success in such external desires, faith in the Lord diminishes. So, give up such desires. Desire only for the spiritual relationship; then you won’t become the target of doubts and difficulties. The important thing for this is faith in the Lord; without that, you start doubting everything, big and small. Devotee: Until we understand the reality of Paramatma, it is important, they say, to be in the company of the great and the good and also to have a Guru. Are these necessary? Sathya Sai Baba: Of course, the company of the great and the good is necessary. To make that reality known to you, a Guru too is important. But, in this matter, you should be very careful. Genuine Gurus are scarce these days. Cheats have multiplied and teachers have retreated into solitude, in order to realise themselves undisturbed. There are many genuine Gurus but they cannot be secured easily. Even if you get them, you must thank your destiny if they vouchsafe to you more that one single Sadvakya (spiritual truth) ; they won’t spend time telling you all kinds of stories! There should be no hurry in the search for a Guru. Devotee: Then, what in the world is the path? 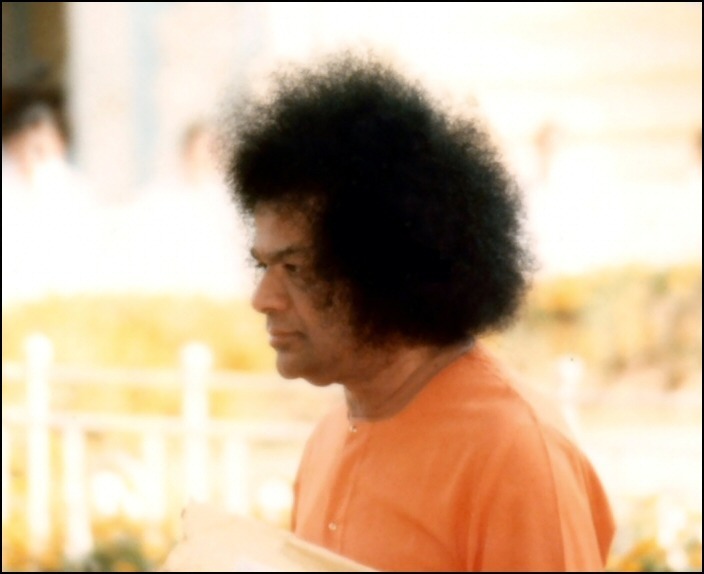 Sathya Sai Baba: Why, it is just for this that we have the Veda, Sastra, Purana and Ithihasa (ancient scriptures) . Study them; adhere to the path they teach and gather the experience; understand their meaning and the trend of their message from Pundits; follow them in practice; meditate on the Paramatma (universal being) as the Guru and as God; then, those books themselves will help you as your Guru. For, what is a Guru? The Guru is that through which your mind gets fixed on God. If you consider Paramatma as the Guru and do Sadhana (spiritual practice) with unshakable love, the Lord Himself will appear before you and give Upadesa just as a Guru. Or, He may so bless you that as a result of the Sadhana, you may meet a Sadguru. Devotee: But, nowadays, some great big persons are granting Upadesa to all who ask; are these not Sadgurus, Swami? Sathya Sai Baba: I won’t say they are or they are not. I declare only this: It is not the sign of a Sadguru to grant Upadesa (spiritual instruction) to any and every person who comes to him with praise, without considering the past and the future, without discovering the qualifications of the pupil and testing whether he is fit. Devotee: Then Swami, I have committed a blunder! When one great person arrived at our village, and when all were receiving Upadesa from him, I too went and prostrated before him and asked him for it. He granted me a good Upadesa; I repeated the Manthra for some time, but, soon, I came to know that the great person was a cheat. Since that day, I lost faith in the name he gave me; I gave up Manthra. Was this wrong? Or, am I right? Sathya Sai Baba: Do you doubt the right and wrong of this? It is very wrong. Just as the Guru, as I told you now, examines the qualifications of the disciple, the disciple too has to critically examine the credentials of the Guru before receiving Upadesa. Your first mistake was that you did not pay attention to this but hastily accepted Upadesa. Well, even if the Guru gave it without the necessary qualification, why did you break your vow and stop repeating the name? That is the second mistake: casting the fault of another on the sacred name of God. Before receiving Upadesa, you should have taken time and known his genuineness and enveloped faith in him. Then, when the desire to accept him as Guru emerged, you should have received the Upadesa. But, once you accept, you must repeat it, whatever the difficulty; you should not give it up. Otherwise, you commit the wrong of accepting without deliberation and rejecting without deliberation. That wrong will be on your head. You should accept a name when you are still afflicted by doubt or a name which you do not prefer. Having accepted, you should not give it up. Devotee: What happens when it is given up? Sathya Sai Baba: Well, my boy. Disloyalty to the Guru and discarding the name of God – on account of these, your one-pointed endeavor and concentration will wither away. As the saying goes, “The diseased seedling can never grow into a tree”.